When we first pick it up and open it, the Bible can seem confusing and perhaps even frightening. Here is this bulky book, made up of seventy-three sections with unfamiliar titles such as Deuteronomy, Ecclesiastes, Colossians, and Corinthians, with numbers in front of almost every sentence, rarely any pictures, and perhaps a few maps of ancient areas such as Mesopotamia, Assyria, and Judah. Since the Bible looks like a book, we may start to read it as we would any other book, hoping to move from cover to cover. Then we begin to wonder, Who wrote this? When was it written? What kind of writing is this: History? Science? Biography? Fiction? What am I supposed to get out of it? As (or if) we keep reading the Bible page by page, section by section, we soon realize that this is no ordinary run-of-the-bookshelf volume. Without a guide the Bible is likely to remain the book most often purchased but not very often read and even less often understood. 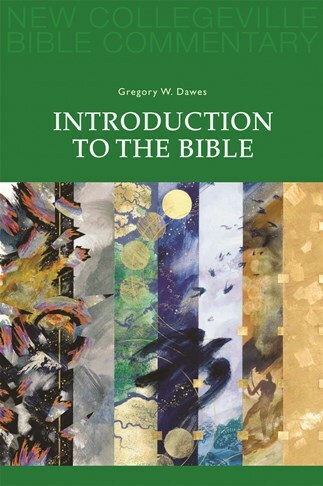 To rescue Bible readers and students from turning their initial enthusiasm into boredom, Gregory Dawes gives us this Introduction to the Bible, the indispensable prologue to the entire series of the New Collegeville Bible Commentary. Dividing the contents into two parts, the author first describes how the Old and New Testaments came to be put together, and then explores how their stories have been interpreted over the centuries. In the words of Dawes, this very broad overview of a very complex history offers the general reader a helpful framework within which to begin to understand the Bible. The author writes clearly, frequently seasoning his explanations with crisp examples. This book anchors individual and group Bible study on the solid foundation of basic biblical vocabulary and concepts. Gregory W. Dawes is senior lecturer in both religious studies and philosophy at the University of Otago (New Zealand). He undertook graduate study at the Pontifical Biblical Institute in Rome, where he completed the Licentiate degree, before receiving a PhD from the University of Otago in 1995. He has written several books, the most recent being The Historical Jesus Question: The Challenge of History to Religious Authority (Westminster John Knox, 2001). He is currently researching Christian responses to the work of Charles Darwin. Complementing the highly successful New Testament New Collegeville Bible Commentary, this short book is an indispensable introduction to the entire series. Dawes continues, underscores our need to appreciate the ways in which the Bible has been interpreted throughout Christian history. . . . Dawes certainly has met his goal of presenting a clear overview of the origins of the Bible and its interpretation. His concise writing style, logical organization, and helpful format devices make this a work suitable for individual and group use. This highly readable guide to the origins of the Biblical writings and to the history of how the Bible has been interpreted provides a rich context for our own informed reading of Scripture. Greg Dawes has the gift of expressing complex and detailed matters in a crystal clear and yet profound way. The book is wonderfully well written and greatly helps us to understand the way the Bible has been and is used in the Church, and the way that theology has developed. Readers of Scripture will greatly benefit from this excellent book. Highly recommended for novice to intermediate biblical students and scholars. At a time when knowledge of the Bible has declined while religious fundamentalism is on the rise, this concise, clear and accurate account of the origins of the Bible and history of its interpretation is invaluable. Dawes is a gifted writer. He not only communicates a great deal of information in a short space but also invites the reader on a journey of discovery, which concludes with a sympathetic but not uncritical account of post-modern developments. This slim volume admirably succeeds in its aim to provide readers of the New Collegeville Bible Commentary with essential background information concerning the Bible and the variety of ways in which it was been interpreted down to the present. This is a fine introductory volume to a series that holds great promise for the average reader.